There will be many situations in your career as a nurse–even after you have a lot of experience–that feel awkward, despite your best attempts. Advocating for shots to a parent who declines is definitely one. Thinking through responses and scenarios ahead of time really helps craft positive interactions with parents. And let’s face it, being a parent and wanting to do the right thing for your children can be stressful with so much information out there. Remember first and foremost, that the interaction and relationship with the parent is the most important part. 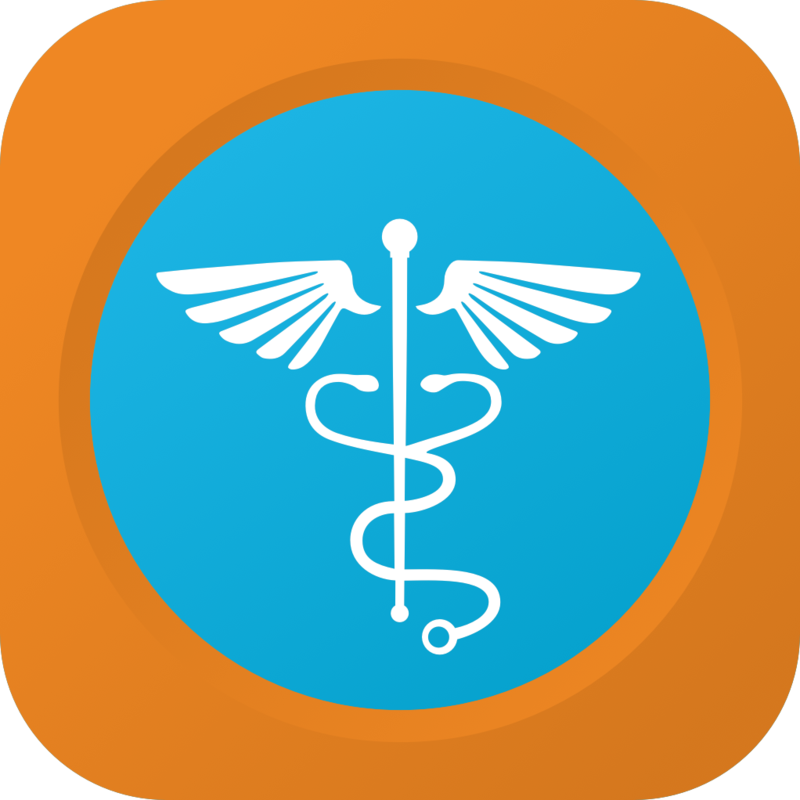 Even if the parents come away disagreeing with widely accepted recommendations, your goal is to open the door and provide information to help them navigate health care for their child–not to judge. Here’s how I breakdown my approach for parents who oppose immunizations for their child…but these are great tips for ANY interaction with parents! When providing education, I always start with the evidence, but NOT before I acknowledge their concern. Taking the time to ask what concerns them is super important because some parents are simply upset by the number of injections and find it distressing to see their child’s reaction to shots. For some families, spiritual beliefs are paramount. As nurses, we must recognize these values and incorporate them into the care plan – always. Vaccine exceptions are always OK, and providers have protocols for documenting exceptions. Schools also have protocols for dealing with exceptions, such as sending kiddos home if there is an outbreak. It’s reassuring to parents to know what to expect if they choose not to vaccinate. That being said, many parents get information about vaccines from sources that may not base their data on scientific studies. It’s important for your second or third question to ask what they know already about vaccines. Maybe they have only talked with other parents about shots. Correct any misinformation. Perhaps they struggled with shots as a child themselves. OK, now that you know what they know and how they feel, you can cover the evidence. Informing parents about the purpose of vaccines–what happens if there is an outbreak and their child is not immunized. This is an important message. Most parents don’t know what rotavirus is or what ‘herd immunity’ means, for example, and feel bombarded by the amount of info they need to process. CDC VIS (vaccine information statement) sheets are overwhelming, and in one visit they may get 4–5 sheets to read. Providing broad concepts with simple messages avoids TMI (too much information!). As for safety, the truth is, there’s plenty we don’t know about newer vaccines; however, many suspicions for harm from vaccines have been studied extensively. Routine vaccines carry very little risk. This is evidenced-based. Although talking about risk is an important part of the conversation, it’s not always what gets parents to consider other views on vaccines. Sometimes it just takes time, and revisiting the conversation is a good approach which brings me to my next tip. Even if parents decline shots, I like to provide CDC VIS sheets to take home. Always ‘plant the seed’ when you provide education. Even if parents decline shots, I like to provide CDC VIS sheets to take home. And before I do, I have a conversation about just how safe vaccines are PROVEN to be. We have the strictest drug enforcement in the world, and regulation of vaccines is UBER awesome. Most parents are overwhelmed by the amount of information the CDC puts inside VIS sheets, and because the sheets are designed to INFORM parents about vaccine risk and SCREEN for contraindications to a vaccine, there’s a lot of scary information on there–like all the bad things that can happen from the vaccine. In many ways, these info sheets are a kind of disclaimer–which is why we are required to provide them prior to vaccination–the CDC is telling them what they know that may contribute to a negative outcome from the vaccine, which although rare, is really scary for parents to read. See my list below of major talking points about vaccine safety to help allay fears! SO, remember to ask open-ended questions to customize your responses so that parents gets the information THEY need to make an informed decision. Informed decisions always require knowing the good AND the bad (the risk and the benefit). Nurses should not pressure parents, but focus on being a trusted resource with the facts. Remember what you learn in school about the therapeutic relationship! For your pediatric clients, this connection happens between you and the parents as well! 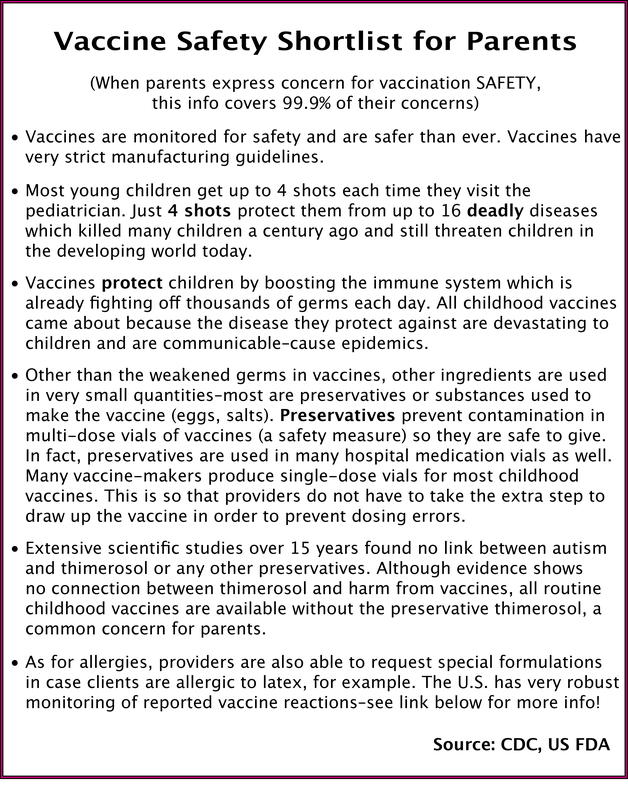 Another great CDC article to be a vaccine safety expert or give to parents to read. My daughter is old enough to get her vaccinations, and your article had some great information regarding this. I liked how you said that vaccines protect kids by boosting their immune system. Thanks; we’ll keep this in mind when considering vaccinations for our daughter. You are very welcome. With the recent Measles outbreak, nurses have to stay on top of these concepts and provide teaching! At the same time we cannot be pushy–it’s a family decision. When I have questions about a vaccine, I research it, and I encourage parents to do the same.Good luck!